PoliceAuctions.com, home of police auctions and government auctions on the web, will be using social media giant Facebook to auction a PSA/DNA authenticated and graded Stan Musial autographed baseball. The one-dollar no reserve auction will start on Wednesday November 7th. Beginning on Wednesday November 7th, PoliceAuctions.com, home of police auctions and government auctions on the web, will be auctioning an autographed Stan Musial baseball. Stan Musial fans have long felt that Musial was not glorified in the same was as the other greats of his era, like Ted Williams and Joe DiMaggio, according to The New York Times. Until February 2011 when, the 24 time All-Star, who hit 475 home runs, and won three World Series Championships, Musial, was awarded the Presidential Medal of Freedom. Beginning on Wednesday November 7th, PoliceAuctions.com, home of police auctions and government auctions on the web, will be auctioning an autographed Stan Musial baseball. The autographed ball being auctioned is a Rawlings official baseball that is sealed in a plastic display cube. The signature is in the “Sweet Spot”. The Musial signed baseball being auctioned by PoliceAuctions.com has been authenticated and graded by PSA/DNA. PSA/DNA has certified over 19 million collectibles valued at over one billion dollars, according to their website. 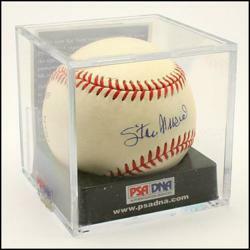 PoliceAuctions.com will be using their Facebook fan page to promote the auction for the Stan Musial baseball. PoliceAuctions.com fans will be able to view photos for the ball and link back to PoliceAuctions.com to bid. The autographed baseball auction will be a one dollar no reserve auction. This means that if the auction for the Stan Musial signed baseball ends at only one dollar than the lucky winner would only pay one dollar, plus shipping and any applicable taxes, for the ball.